I went with my bookish friend, A, to Cha-An last week for dinner. They are located on the second floor and as of last week they only take cash. They are rather small, and have a tea room in which they do 30 minutes Japanese Tea Ceremonies. Inside it’s very nice; the decor is very earthy and peaceful. I decided to do the Afternoon Tea Set ($18) which came with two bagel sandwiches, scones with preserves and cream, an assortment of sweets and tea of your choice. The bagels were on the small side but were soft and yummy. I loved the salmon that came with the sandwich. I chose the genmaicha tea, which had a very earthy taste due to the rice that sits soaking in the tea. I loved it! I forgot the tea that A had, but I remembered that it was a fruity one and she liked it as well. The bagels came in a little basket, but I was too hungry to remember to take a photo of it. I did remember to take a photo of the dessert though. It came with a green tea macaroon which was yummy. 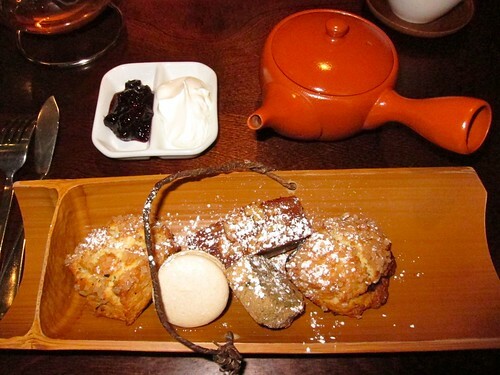 The scones were crunchy on the outside — due to some sugar-like crystals — but was soft on the inside. 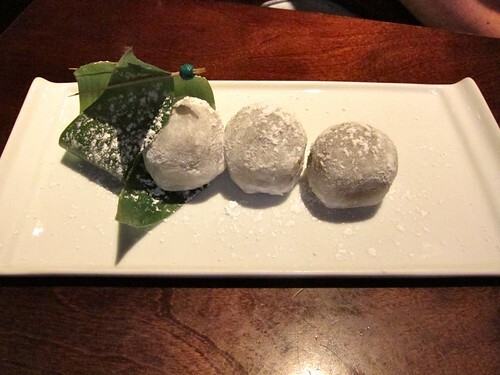 The mochi dessert was A’s choice; all three were chocolate mochi and it was delicious! The portions were small but filling, which was good. Usually tea services are so large that it’s difficult to finish it all; however, I was able to finish everything without issue. I’d definitely go here again; their lunch menu looks delicious.